The use of heavy equipment or technological machinery is necessary for many manufacturing facilities. In order to keep the necessary parts of the business maintained, lubrication as well as cleanup from oil and flammable liquids is critical. Storing specific types of oils and flammable liquids on site can be dangerous for personnel and investments alike. Utilizing chemical storage buildings to store flammable and combustible chemicals can increase the safety of facilities and personnel working inside and outside of those facilities. 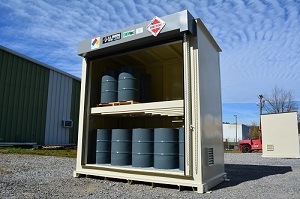 Learn more about flammable liquid safety and flammable liquid storage buildings in the article below. The NFPA 30 Flammable and Combustible Liquids Code, NFPA 400 Hazardous Material Code and the NFPA 1 Fire Code offer an understanding for handling hazardous materials safely. Property setbacks, storage of flammable materials and spacing between chemical storage buildings must all be considered when storing hazardous material inventory inside a chemical storage locker. FM Approval requires a product design standard that chemical storage lockers must meet “Class 6049 Storage Buildings and Lockers”. These standards include roof, wall and flooring designs to show compliance ratings for non-fire rated and fire rated chemical storage lockers constructions. Ventilation is required for chemical storage buildings when storing flammables and combustibles. Chemical storage buildings can be equipped with natural ventilation or mechanical ventilation accessories, depending on the amount and toxicity of the chemicals. Chemical storage ventilation systems help rid chemical storage buildings of toxic fumes that may be harmful to personnel entering or working around facilities. When storing hazardous liquids it is required by the EPA that all chemical storage buildings have a EPA compliant secondary sump containment system. Chemical storage buildings are engineered with built-in, leak proof secondary containment systems to capture any spills, leaks or hazardous events. The type of hazmat storage container selected will determine the appropriate proximity to occupied facilities and property lines. The International Building Code specifies minimum distances, shown below. To learn more about flammable chemical storage buildings or to receive a free chemical storage consultation call 1-800-233-1480 or contact US Chemical Storage online.